The Triumph Speed Triple SE gets more than just a cool paint job with uprated suspension, flyscreen and seat cowl and retains the 128bhp three-cylinder 1050 motor common to all Speed Triples. The suspension changes will be introduced on all Speed Triples in 2010 as the bike enters what is thought to be the final year before a new model is scheduled to replace it. It may be heading into its fifth year of production but it remains a great-looking bike with the performance to match. 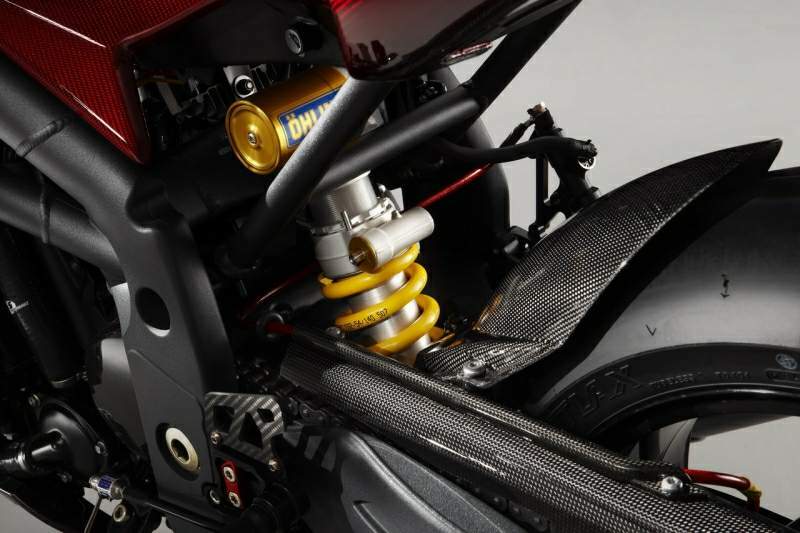 The suspension changes include modified internals in the forks and shock to improve the damping. Combined with a five per cent softer rear spring, Triumph claim a better ride and reduced fork dive under braking. 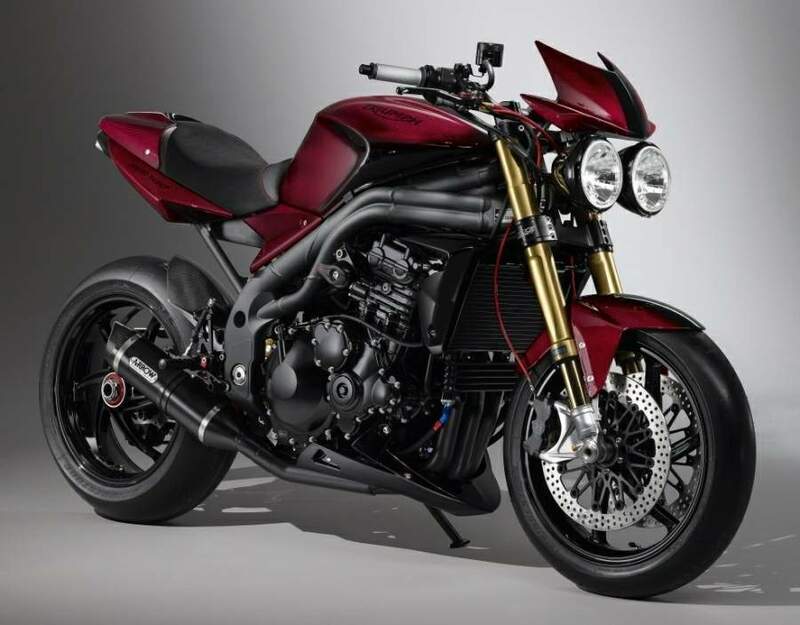 Triumph is celebrating 15 years of the Speed Triple, the most successful motorcycle of the company’s modern Hinckley era, with a distinctive limited edition model. Triumph pioneered the now-famous “streetfighter” style in the early 1990s by pulling inspiration from a growing group of enthusiasts that were modifying their track-based motorcycles for a more menacing look on the street. The “streetfighter” or “naked” category of motorcycles was born and the Speed Triple has maintained a strong hold on the category ever since. The limited edition 15th Anniversary Speed Triple stays true to the bike’s original inspiration by featuring unique Phantom Black metallic paint, hand-finished red pinstriped wheels and ‘15th Anniversary Special Edition’ decals on the flyscreen and rear bodywork. 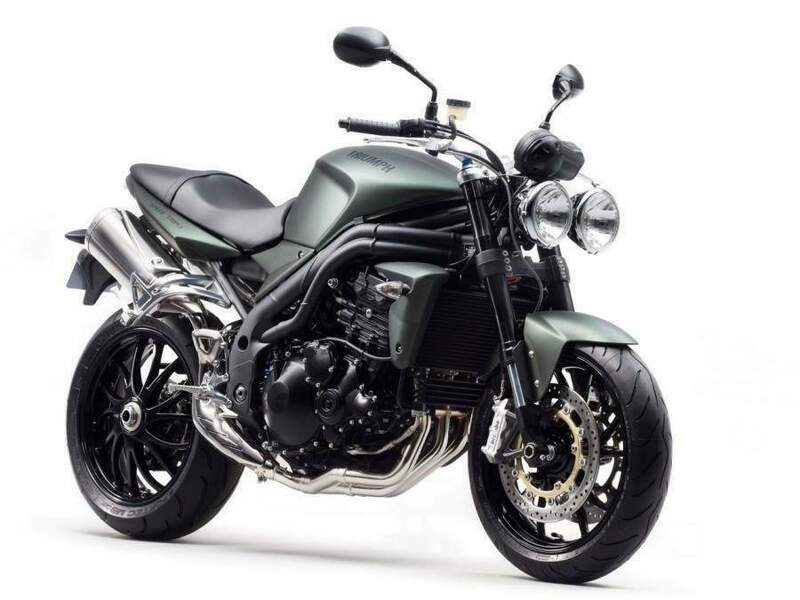 A number of Genuine Triumph accessories available as options for the regular Speed Triple come as standard equipment to complete the custom look of the 15th Anniversary model, including a gel seat and a color-matched flyscreen and bellypan. This anniversary has prompted John Bloor, the British entrepreneur who rescued Triumph and rebuilt the marque to become one of the fastest growing motorcycle manufacturers in the world, to authorize the use of his signature on a production model for the very first time. More than 35,000 Speed Triples have been sold since the model was introduced. 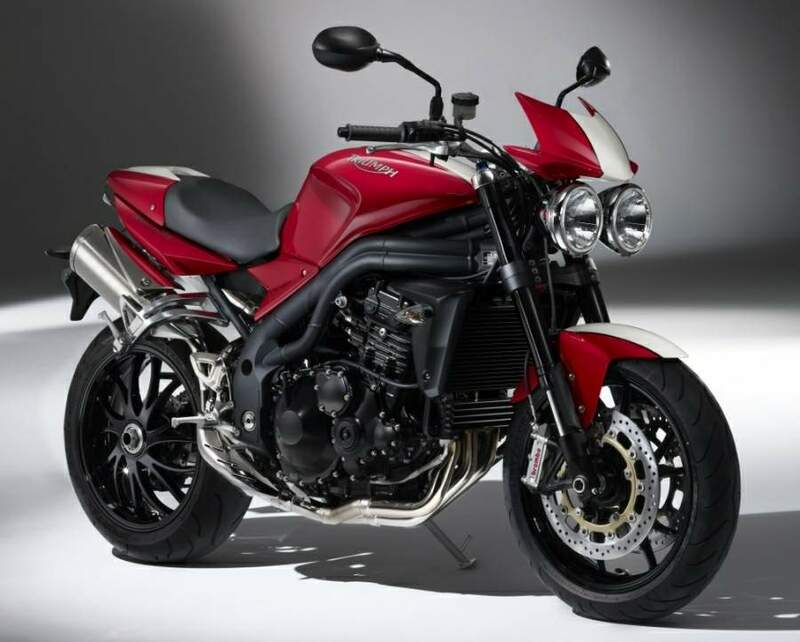 First hitting the showrooms in February 1994, the three-cylinder Speed Triple embodies Triumph’s British bulldog spirit. Drawing heavily on the influence of the stripped down café racers of the 1960s, the first models were powered by a 97hp version of Triumph’s modular engine and were a regular sight on British race tracks in the thrilling Speed Triple Challenge racing series. Over the years, the Speed Triple evolved to become the definitive factory streetfighter. The arrival of the fuel-injected T509 Speed Triple in 1996 saw the introduction of the radical twin bug-eyed headlights, single-sided swing arm and oval section frame that have since become Speed Triple trademarks. In 1998 the streetfighter look was completed with the switch from low-slung clip-on handlebars to the classic tall and wide handlebars. The Speed Triple also hit Hollywood, first in the Matrix and then alongside Tom Cruise in Mission Impossible 2. With each generation, the Speed Triple has become lighter, more powerful and brimming with even more attitude. Weighing in at 416 lbs. and developing 130hp and 77 ft. lbs. of torque, the 2009 Speed Triple is the lightest and most powerful version to date. The bike’s distinctive triple sound is accompanied by a smooth and muscular power curve that pulls strongly from idle to red line. Handling is agile and precise and is augmented by powerful Brembo radial front caliper brakes. Engine: Weighing in at 189kg and developing 132PS and 105Nm of torque, the 2009 Speed Triple is the lightest and most powerful version to date. With its distinctive triple sound accompanying a muscular linear power delivery that pulls strongly from tickover to red line, combined with precise and agile handling. Brakes: Powerful Brembo radial front caliper brakes supply precision braking performance. Bodywork: The Speed Triple’s rear-end has sharp, minimalist styling. It features a new rear sub-frame, polished stainless steel heat shields and repositioned aluminium pillion footrests to give passengers more leg room. It also sports a clear-lens LED rear light. Accessories: The Speed Triple 15th Anniversary Special Edition is based on the 2009 Speed Triple and comes equipped with a number of additional items as standard, including a colour matched bellypan and flyscreen. Also included is a stylish and comfortable Gel Seat from the Genuine Triumph Accessories range.